In order to make your online banking experience as secure as possible, our online banking has a security feature that detects any uncharacteristic or unusual behavior involving your account. If anything out of the ordinary is detected, we will verify your identity. Answer and verify three security questions. Enter and confirm your phone numbers. Continue banking, with an even higher level of security. What other types of Multi-Factor Authentication does Dalhart Federal Use? Dalhart Federal’s online banking uses the new and more secure Extended Validation Certificate method of multi-factor authentication. An Extended Validation Certificate (EVC) is similar to the standard certificates used previously for securing web communications. They include SHA2 256-bit encryption to secure customer information. Additionally, the site, the site owner and persons responsible for the certificate are more strictly verified by the certificate authority. 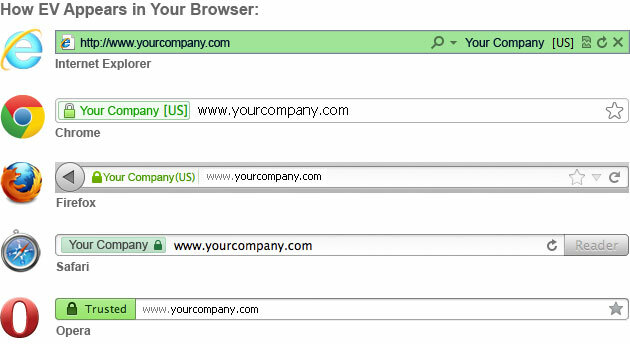 Legitimate certificates are detected by browsers and the owner of the site and certificate is easy to detect. What changes will our customers see? In order to make your online banking experience as secure as possible, we are introducing a new security feature. Most of the time your online banking experience will be the same as it was before, only now you will have an extra layer of security working behind-the-scenes to protect your account. The new security may - very infrequently - prompt you to verify your identify before continuing. This means you can now bank online with a renewed sense of confidence. As our customer, we know how you typically behave: what types of transactions you conduct, when and from where. If we detect any activity that does not seem like your typical behavior, we will prompt you to further verify your identity-so that we can ensure it is you and not a fraudster attempting to access your account. This will only happen on rare occasions. Normally you will not be asked for any additional information. For example, if someone tries to sign in with your user name and password from a computer in a foreign country shortly after you have logged off from your normal computer at home, we may decide to verify that it is really you trying to access your account. At some point, while banking online, you will be prompted to enter additional information. This will include choosing several security questions that only you know the answers to, as well as supplying phone numbers where you can be reached while banking online. Once you have entered this information you will have added an additional layer of protection to your account! The security system takes into account factors such as the type of transactions you ordinarily perform, the computers you typically use to access your information, or the typical security settings for your computer. Hundreds of factors, such as these, create a profile that is unique to you that allows us to make decisions about whether the person conducting a given activity and transaction within your account appears to be really you. If your user name and password are stolen, the fraudster would have to be able to answer your security questions correctly before being able to access your account or complete a fraudulent transaction. If the user is not able to provide this information or be reached on the phone, the activity would be blocked. This added layer of security helps us protect your online account at all times. It is great you check your account! It is always a good idea to regularly monitor your account for any unusual activity (like payments you didn't make). This security service helps prevent those incidences from ever occurring, so when you check your account everything is exactly how it should be.